So, this one has been on my “to do” list for a while! I first saw this apron in “Southern Living” magazine and since then, all over blogland! 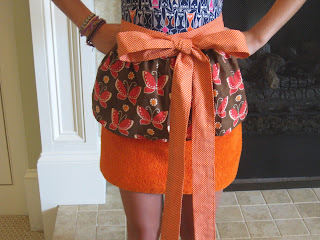 It is soooo cute and very practical! Now, before you go thinkin’, “Man, she’s skinny!”…. 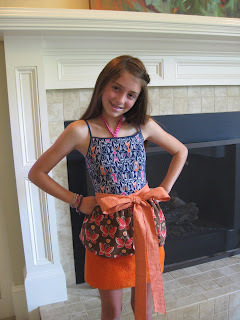 my daughter is doing the modeling, since neither of my children could take a non-blurry photo! Soooo, the tie would not be nearly as long on us ladies!! 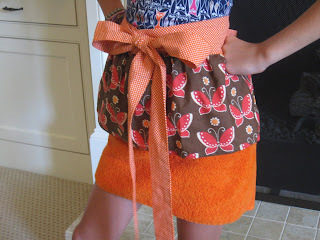 The apron is made from a simple hand towel and a cute butterfly print fabric!! 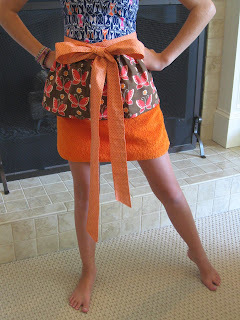 I added a sweet micro polka-dot orange tie to top it off! We are HUGE orange fans in our house! 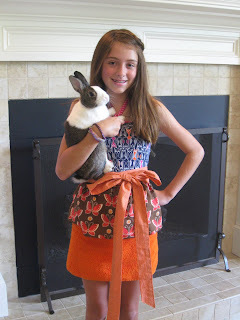 Even our bunny, Sammi, LOVED the apron!! My daughter wants one in her size. She thought the towel was “really cool”! I can just see us baking up a storm this fall and it will be awesome to just be able to toss these in the wash! The possibilities are endless for cute color combos! Don’t i look pretty!!!!! Thanks for making Sammi famous mom!!! You all remind me of this other couple who prints cookbooks and sells neat items not found locally. The apron is so neat and quick. Love a craft to make which is quick. I’ll be visiting your site again, as I’m a stay at home wife and mom,etc. one grandchild, Noah. The computer , been away from it for 7 years, taking care of my parents. So I’m like a kid with a new toy. Love your work and creations.